This engraving was designed, engraved, and published by Edward Gallaudet (1809-1847). 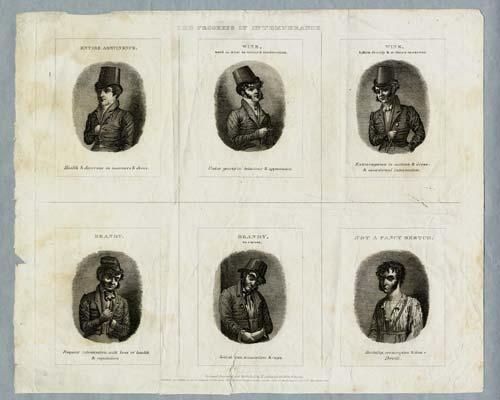 Published in 1831, in Boston, Massachusetts, this engraving is a series of six smaller engravings that give a portrait of a man as he descends from sobriety into drunkenness. It depicts a man transforming from a fine, upstanding citizen, into a brutish man, with the expectation of an early and ugly end. The engravings are based on the drawings and paintings of William Hogarth of England (1697-1764), a connection most people of the time would have quickly made. In his work "A Rake's Progress", done in 1735, Hogarth illustrates his hero, Tom Rakewell, and shows his progressive descent into debt and madness. The idea presented in both "The Progress of Intemperance" and "A Rake's Progress" is that sin carries its own punishment. Dimensions: Image and text 26 x 28 cm., on sheet 28 x 34 cm.